Amersham™ Hybond™-N+ is a positively charged nylon membrane with a binding capacity for nucleic acids up to 600 µg/cm² recommended for use with radioactive or non radioactive chemiluminescence and chemifluorescence detection systems. 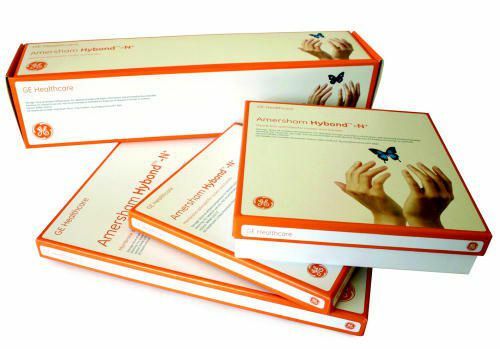 Amersham™ Hybond™-N+ yields excellent sensitivity in conventional Southern blotting. Nucleic acid samples may be fixed by UV exposure or baking, although UV fixation is best for maximum reproducibility. Caution: Amersham™ Hybond™-N+ is not suitable for alkali blotting and fixation.